services. You can enjoy of a private, equipped beach, a swimming pool with different depths, a sun terrace and a variety of sport activities. It is a perfect choice to grant a special vacation full of fun and relax. It is located in the Bay of Porto Conte, a natural oasis between Capo Caccia and Punta Giglio. The hotel’s position is ideal not only for nature and sea lovers but also for people who like the little town such as Alghero, one of the favourite destinations for holidays in northern Sardinia. The Corte Rosada Couples Resort & SPA faces on a blue sea and on a private and sand beach. The coast is composed by small inlets and caves, partially submerged by sea water such as the spectacular caves of Neptune. 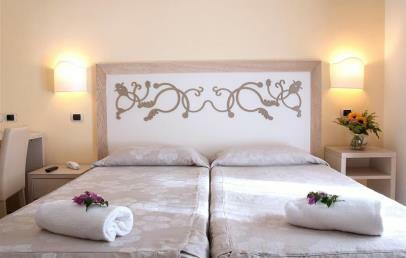 It is nestled in a thick pine forest and surrounded by the typical Mediterranean vegetation aroma. Surrounded by pine trees, in a Mediterranean spot of Sardinia, the Corte Rosada Couples Resort & SPA is characterized by an excellent service. It consists of a main building, where are located the reception, a breakfast room, the SPA and different annex buildings, where the rooms are located. You can relax by the pool, filled with sea water, or enjoy any sport activities on the beach or use the fitness area facing the sea. The hotel is – Adults Only – teenager are welcome from 18 years. 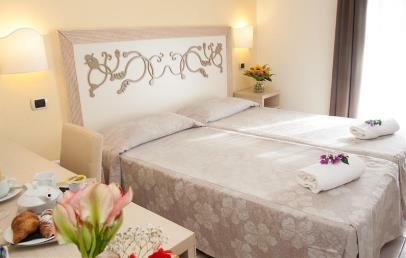 The hotel has in total 152 rooms, distributed in the 10 small 2-floor-villas. You can choose of a room with a patio located on the ground floor or with a balcony located on the upper floor (reachable only by stairs). 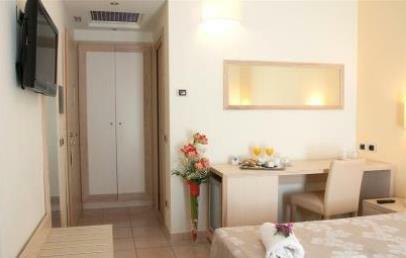 The rooms are double and have a size of approximately 19 sq.m. to 32 sq.m. 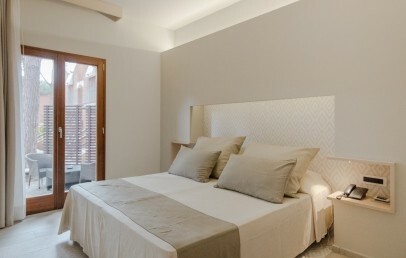 They are modern and elegantly furnished, equipped with every comfort and Wi-Fi internet connection. Corte Rosada Couples Resort & SPA has a private sand beach area directly by the sea, partly rocky seabed. The beach is only 50 m from the main building and is equipped with sun beds and umbrellas. Beach towels are complimentary during the stay, a deposit has to be paid on arrival. By car you may reach different beaches along the Baia di Conte or in the surroundings of Alghero. La Rosada SPA – Body & Soul offers a wellness area with whirlpools, sauna, Turkish bath, ice fountain, emotional showers (aromatherapy and colour therapy), Kneipp pool and a gym. Moreover you can choose between various wellness and beauty treatments, health and beauty paths for face and body to enhance the psycho-physical balance. For couples are offered different wellness packages "You & Me". Contact us now for more information. A PADI Dive Center is located in the hotel area of Corte Rosada and offers courses for beginners and advanced divers, half-day or full-day excursions and snorkeling equipment. The staff, qualified PADI trainers, guides you during the excursions in the protected area of Capo Caccia and in the gulf of Porto Conte. Moreover the hotel has tow tennis courts with flood light and canoes for guests use. On the upper floor of the main building is a bright fitness room with view over the beach. You can have breakfast at a dedicated room with sea view and it consists of a buffet service. The restaurant is located in the main building, with air conditioning and offers a beautiful sea view. Light lunch is available at the American Bar on the terrasse. The dinner is served in the restaurant with à la carte menu. Close to the sea and embedded nicely in the garden is the sea water swimming pool. For a cool drink the piano bar "Rosada beach" is awaiting you. At the beach can be practiced different activities and for those who wish to discover more about the region, the staff will be glad to provide you more information and book an excursions. Nice double rooms furnished in a modern style and are equipped with air conditioning, Wi-Fi connection free of charge, LCD TV, safety box, minibar. 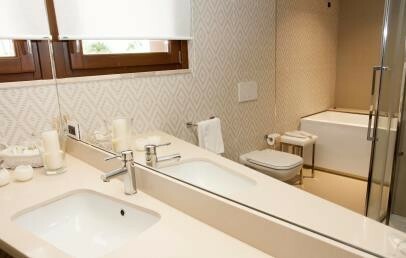 The bathroom has a shower, a hairdryer and complimentary toilette products. 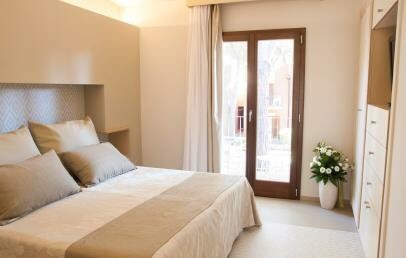 The rooms are located in the central part and face the garden and have a balcony or a patio. Possibility to have rooms with connecting door (on request, upon availability). The Superior rooms are spacious with a living corner with sofa and desk. They are equipped with modern amenities: air conditioning, soundproofing, complimentary Wi-Fi connection, flat-screen TV with satellite channels, wardrobe. 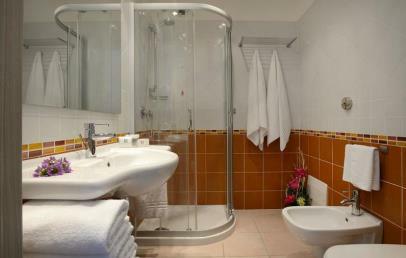 The bathroom features a big shower, bidet, bathrobes, slippers, hairdryer, toiletries. 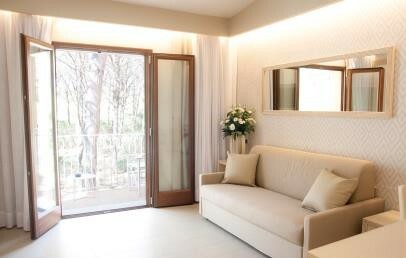 The rooms are located in central area and have a small balcony or patio with view over the pinewood/garden. The rooms have an individual entrance on the upper floors and are accessible only by stairs. The Deluxe rooms are spacious with a living corner with sofa and desk. 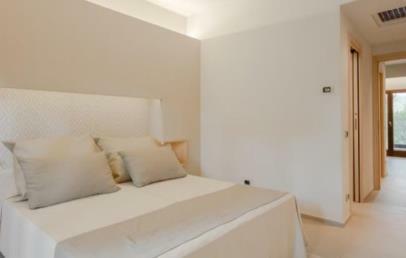 The rooms are bright and offer an individual entrance and are located in more central area. They are equipped with air conditioning, soundproofing, complimentary Wi-Fi connection, flat-screen TV with satellite channels, wardrobe. 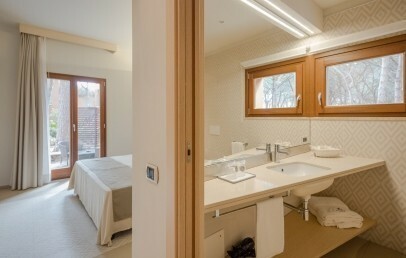 The bathroom features a whirlpool tub, shower, bidet, bathrobes, slippers, hairdryer, toiletries. The view of the rooms goes over the pinewood/garden. Nice double rooms furnished in a modern style and equipped with air conditioning, Wi-Fi connection free of charge, LCD TV, safety box, minibar. The bathroom has a shower, a hairdryer and complimentary courtesy set. The rooms are located in the central part and face the sea and the pool.